Nearly 600 Central New Yorkers viewed images of birds taken by local wildlife photographers at the “Images of a Restored Habitat” bird photography exhibit on March 25-26. The exhibit highlighted the diverse range of bird species that have returned to recently restored areas along the Onondaga Lake shoreline. The Onondaga Lake Conservation Corps hosted the exhibit in partnership with Audubon New York and Honeywell. Onondaga Lake became a priority Audubon Important Bird Area (IBA) in 1998 and was subsequently adopted by Honeywell, Montezuma Audubon Center, and Onondaga Audubon Society because of its value to waterfowl and Bald Eagles during the winter months. The IBA is a bird conservation initiative that connects local communities to environmental stewardship and helps to improve the quality of habitat for birds and other wildlife. This year’s exhibit featured 11 local photographers, more than any other year. 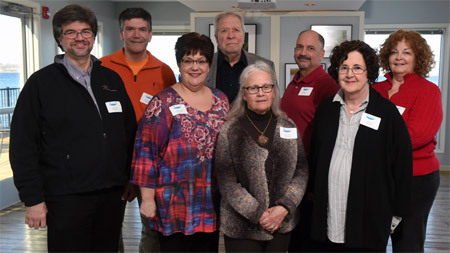 The photographers pictured left to right (front row): John DeNicola, Michele Neligan, Cheryl Lloyd, Carol Keeler, (back row): Warren Wheeler, Tom Lloyd, Phillip Bonn and Diana Whiting. Not pictured: Greg Craybas, Jonathan Kresge and John Savage. View photographs that were on display at the exhibit. Visitors met the photographers who captured the images and had an opportunity to look for birds in their natural habitat with experts from the Montezuma Audubon Center and Onondaga Audubon Society. Left: Joe Kondratowicz, of Camillus, New York, helps his daughter Aeryn use binoculars to identify bird species. Right: Michele Neligan (left), a former Onondaga Audubon board member and a photographer exhibiting at the event, helps Peg Arinsen, of North Syracuse, New York, use a scope to identify a Red-breasted Merganser. As part of the Onondaga Lake cleanup, Honeywell is planting about 1.1 million plants, shrubs, and trees in the Onondaga Lake watershed. To date, more than 70 acres of wetlands have been restored and more than 180 species of birds, fish, and other wildlife have returned to restored habitat near the lake. More than 80 unique bird species have been identified in and around Onondaga Lake, including several species categorized as threatened or of special interest in New York State. Pied-billed Grebe, Northern Harrier, and Bald Eagle are among the notable bird species that have returned. The Onondaga Lake Conservation Corps seeks to inspire future stewards of Onondaga Lake and its watershed through a hands-on, experience-based program that offers citizens and organizations the opportunity to participate in activities that help restore and sustain Onondaga Lake and its value as an IBA. Since its formation in 2012, more than 650 community members have participated in Corps planting events. To learn more about the Onondaga Lake Conservation Corps or participate in future activities, please contact montezuma@audubon.org or call 315-365-3588. Schools, community groups, local organizations and individuals are welcome. Like the Corps on Facebook or visit YouTube to learn more.